Is it possible to identify, construct, or specify beyond vague generalities, a definition of ethics that would be universally credible and appropriate? Can a hypothetical universal ethical code be equally relevant in diverse contexts? Were one to be constructed, would the fact that it is interpreted by individuals socialized in different contexts of reality and truth, render it less relevant or even irrelevant in some contexts? It is sometimes difficult for my logical, physics-math brain to accept that a discussion about ethics does not result in an answer that can be scientifically tested. Don't misunderstand me. I don't think science always leads to one right answer, contrary to how most students in K-12 learn science. But, science can be tested and contested and better answers can be found. Things are different when trying to agree on answers to questions about ethics. I'm not sure that it is possible to develop a code of ethics for any field of study that all parties can agree on. 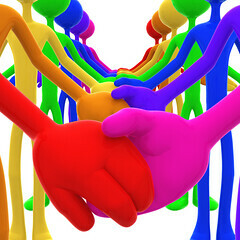 As the article states, the more diverse the group of people, the more difficult it becomes to agree on a code of ethics that is applicable to everyone. But, does this mean we should give up? NO. I believe the discussion is more important than the answers. As our workplaces and schools become flatter, we are forced into a global society. Even though our discussion about ethics becomes difficult, we stand to gain a global awareness and sensitivity that we may not have had before by continuing the discussion with the diverse people we encounter. As we deal with diverse cultures and writing codes of ethics, the article gives two frameworks within which we could work. Ethical universalism is what I call the I'm-right-you're-wrong framework. I view myself as above you, so I attempt to teach you my right ways. The second framework is cultural relativism. With this framework, "they do not come to teach or to transmit or to give anything, but rather to learn, with the people, about the people's world," (Freire, as cited in this article). I love this quote. If we all made a pact to learn from each other, we may not agree on a universal code of ethics, but I bet the discussion would be worthwhile. A teacher working for Virtual High School states that teaching online has helped her in her face to face classes. She is better at clarifying instructions and connecting with students and families, both of which require a more conscious effort when working online. In an online class, students do not have the benefit of tone of voice and teachers do not have the benefit of confused looks to know when to try a new approach. Online teachers must rely on clear and articulate instructions and building an environment of trust so students know they can contact their teacher when needed. Constant interaction between teacher and student is important. Virtual High School has a major professional development component because they understand that online learning is a "new perspective on the notion of teaching and learning," (Dorste and Dorste, p. 57). In order for teachers to be successful, they need to understand the technology used and also the pedagogical strategies that work for online learning. The same is true in the face to face classroom. If we want teachers to adopt the strategies that work for learning, we must support them to do so. This concludes my reflection about how e-learning can help us in face to face classrooms. Can you think of other things that online learning is teaching us about how to increase learning in face to face classrooms? Online learning changes the role of a teacher. If the online class is designed properly, the teacher becomes a guide on the side instead of a sage on the stage. We know already that this is how a face to face classroom should be too, but lecturing still seems all too prevalent. Again, in a face to face classroom, we can have the best of both worlds. There are times when the best way to convey a piece of content is with a short lecture, but it doesn't have to be the main teaching strategy. Ironically, by looking at the design of online courses, we can gain many ideas for how to make the face to face classroom more interactive. I listened to a NECC 2008 session by David Thornburg posted as a podcast by Wesley Fryer at Moving at the Speed of Creativity this week. When teachers are first given technology to use, they tend to use it to do things they normally do without the technology like word processing. We need to do more as teachers. We need to use technology to do things that we could not do if we didn't have it. Droste and Droste say that each year at Virtual High School "6,000 students have gotten to know other students and teachers from around the globe, exchanging knowledge, ideas, and perspectives in ways that can't happen in a traditional classroom," (p. 57). A teacher in Ohio said that online learning should "not only supplement, but transcend their normal high school experience," (p. 62). Our challenge as face to face classroom teachers is to use technology to do things with students that we could not do otherwise. We need to transcend their normal classroom experience and give them much more. But, we also must remember that learning is about learning, not about technology. "The technology will face into the background as a catalyst to a learning revolution," (Maeroff, p. 70). Technology is "nothing more than the world's fastest school buses," (Droste and Droste, p. 59). Continuing on the cultural impact of technology theme, this week's readings centered around online learning and how technology has impacted how, when, and where we can learn. Both articles give advice to schools about why to offer online learning. (Do not do it for the profit, but instead to offer alternative ways to deliver learning.) Both articles address the question, "Does online learning offer a better way to learn?" Mearoff suggests that this question implies that "being equal is not enough," (p. 69). Droste and Droste cite data from their Virtual High School that their online students show a higher level of achievement. In fact, most research that has been done comparing online learning with face to face learning has concluded with no significant statisitical difference. If all else is equal, why not offer more ways to access learning. 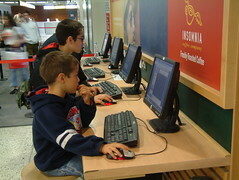 Both articles cite terrific examples of online learning, such as online courses for high school age children of migrant workers so they can participate as they move around, allowing students to sign up for courses that small schools can't offer so the school can keep its accreditation, allowing students who are ill to continue to participate in class, offering high level science courses that student would not be able to access otherwise, etc. But what I came back to again and again as I read both articles was this question: can e-learning teach us anything we can use in the traditional face to face classroom? My answer is a definitive yes. Over the next few days, I will post some of these e-learning strategies here. First, online learning puts more responsibility for learning on the learner. 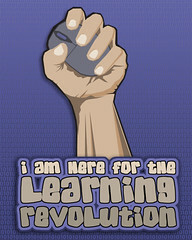 Online learning places "the destiny of students in their own hands," (Maeroff, p. 68). Online students must be disciplined to check and interact with new content on their own time. It is up to them to know when things are due. There is no teacher at the front of the room reminding them every day when to do what. The author does admit that an irresponsible learner may have a problem with this. But, in a face to face class, you can have the best of both worlds. We can place more responsibility on our learners, but still be in a situation where we can intervene if needed. It is always a challenge for me to place responsibility on the learner, even though I know the benefits for learning. It usually comes down to lack of time. What are your strategies for placing more responsibility on students and still meeting your curriculum deadlines? Please share. In The Cultural Impact of Computer Technology, Sheldon Ayers discusses two technology revolutions, the industrial revolution and the information revolution. The industrial revolution was characterized by more efficient manufacturing, which led to a demand for better infrastructure for transportation of goods, which led to a "spirit of innovation" in road engineering, which led to a decreased travel time between London and Birmingham from 2 days to 19 hours, which led to "reduced rural dullness". But what does all of this have to do with learning? The author notes that our progress will require us to rethink many things including how we learn. Recently, my cousin was lamenting the fact that she has to buy her freshman daughter an expensive graphing calculator. Being the math and science teacher that I am, I reassured her that yes, it is expensive, but is an important tool for learning math. Another cousin interjected, "Why? We never had those." This is a valid question to which I didn't have a ready response. It is difficult sometimes to see the benefits that technology brings. What I wanted to explain to my cousin is that a graphing calculator is like a better road. Except, not only can it decrease the learning time between points A and B, it provides a deeper understanding of a new concept. I experienced another example of rethinking how we learn this past week. Ginger L. of the Turning Point Learning Center in Kanses invited me via Skype to her classroom of 5th and 6th graders. As we talked about sextants and how they are used, questions arose. When students did not have a convincing answer to a question, Ginger sent them to their computers to research. My cousin might say, "We didn't have macbooks. Why do they need those?" Well, we had to memorize information or rely on our one textbook. Considering that we forget 90 percent of what we learn in class within 30 days (Brain Rules, p. 100), what's the point in memorizing. And, our one textbook was limited in the information it could give us. The Internet, however, is a vast resource that can deliver a lot of good information if used effectively. If Ginger's students do happen to forget 90 percent of what they learned last week (which I doubt! ), I bet they will remember how to research and get it back. Along with the information revolution, I think we are experiencing a learning revolution. We must rethink how and why we are doing what we are doing in the classroom. We must evaluate the new tools technology is giving us and use them to increase ours and our students' learning.